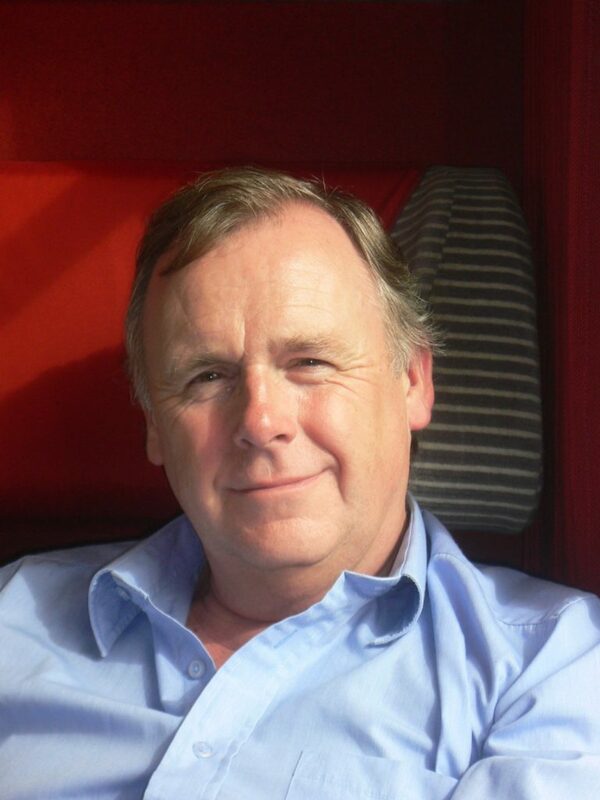 In this blog we remember Malcolm Doolin (16 February 1950 – 20 March 2018). Malcolm was one of the first volunteers on the Great War Theatre project, and a leading member of the group who developed the second phase of the project. His obituary is written by Eve Wilson who volunteered together with Malcolm, her husband, in 2016 and who continues to play an important role in the project, most recently in her work with the Western Front Players. Malcolm was one of the first group of volunteers for the Theatre in the Great War project and the community involvement signatory as Helen rolled the project out. The project was a perfect fit for his interests. He grew up in Dover and attended the local grammar school. He found his formal education unstimulating but outside school he developed interests that would last a lifetime. His father was a railway employee and as a teenager, Malcolm used his free rail pass to travel to London by himself getting cheap theatre tickets in the “Gods” to see all the famous actors of the day perform. Later, he trained as a teacher of English and history in Worcester and made the most of its proximity to Stratford on Avon, before moving to London to work. In 1977, he met me, a teacher of English and drama. We began directing plays together, including at the Theatre Royal Stratford, and of course our theatregoing continued, becoming even more frequent and involving better seats as our careers progressed! The Great War was another passionate interest Malcolm developed as a boy. He was fascinated by his grandmother’s photograph of her brother, Ernest, who, she told him, had been “blown to bits” in 1918 and was commemorated at Dud Corner Cemetery, Loos. In the 1990s he researched Ernest’s war and began to visit France and Belgium regularly. Setting up his own education consultancy in 2003 gave him more flexibility to pursue these interests and in 2013 he completed an MA in First War Studies. In 2015, he became an author and a popular speaker: the headteacher of a local school asked him to research their school memorial. Malcolm did this with such customary thoroughness that it became a book The Boys of Blackhorse Road which tells the story not only of the Boys and their war, but also of their school and the changing area in which they lived. It can be no surprise then that in 2016, when we attended a day about Great War Theatre at the National Archives led by Helen Brooks, we immediately volunteered for her new project using the Lord Chamberlain’s records at the British Library to create a database of plays submitted for production during the war and we loved the work. Since his death, many people have talked about Malcolm’s ability to inspire others with his own enthusiasm, his skill in spotting opportunities and developing potential in others. These qualities are well demonstrated by what happened next. 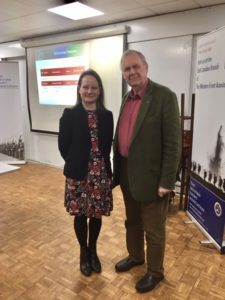 By this time, Malcolm was a committee member on the local branch of the Western Front Association and had invited Helen to speak about the project at a meeting. 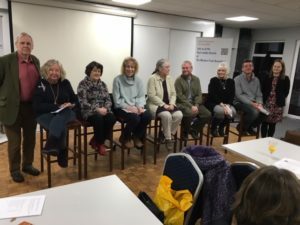 When Helen suggested it would be good to see a play in performance, Malcolm recruited and directed volunteers from the branch in a rehearsed reading. And so, the Western Front Players were born! At a time when membership of the WFA was declining nationally, the East London Branch was acquiring a reputation for vibrancy and innovation largely because of Malcolm’s vision and in January he talked about his work at the national conference – including, of course, encouraging others to make use of the Theatre in the Great War Project. Malcolm was much loved and is much missed. He is remembered in numerous ways including through the continuation of the work he started in many spheres of his life. In September, six months after he died, the ambitious World War One Day he had planned attracted over 700 visitors. It included a reading by the Western Front Players of Tommy by the Way, by Oliphant Down. Later it featured in Dan Snow’s documentary about the project. Malcolm would have loved it. Malcolm has left a wonderful legacy that is brilliantly celebrated in Evelyn’s obituary. This has been an inspiring collaborative work orchestrated by you both that should both inspire others as well as serving to keep Malcolm’s memory alive. Evelyn Malcolm would be so proud of you!